Deckwortverzeichnis für den Jägersprechverkehr. (OPERATIONAL BREVITY CODE). The list of codewords listed below is based on a list contained in "History of the German Night Fighter Force", G. Aders, Jane's Publishing Company, London 1979, corrected by the German edition. 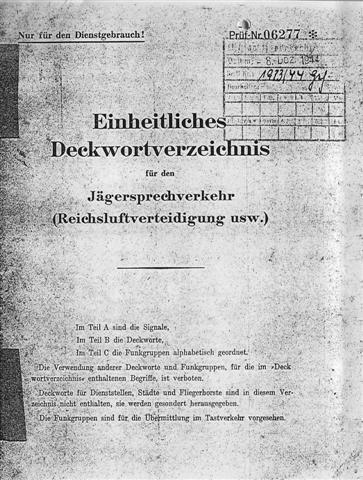 Additionally "Die Geschichte Der Luftnachrichten Dienst, Band II, Teil 1", Anlage 5 by K.O. Hoffmann has been used as a supplement. It contains most of the codewords used for night (day?) fighter control. It should be noted that the intention of the usage of the expressions mainly was to give a shot and precise order, rather than "encrypt" the meaning of the expression. I have adjusted the Operational Meaning/Notion in order better to convey the proper meaning of the codeword seen in a tactical context from an aircrew/intercept controller's point of view. 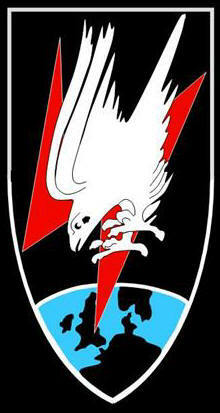 This process was also to some extend based on a POW report in PRO Air 40/1392 detailing intercept procedures. Please read it carefully, it is a very interesting list. It conveys at lot of information related to the descriptions given elsewhere on this site. In the up-dated version, which to a larger extend is based on reports found in AIR 51/292 it is noteworthy that most orders and responses could be conveyed either as codewords using R/T or Morse letter groups using W/T. W/T was used for Zahme Sau, but not for Himmelbett-Verfahren. Late in the war the JK used W/T solely and the JD used W/T mainly, with R/T only used occasionally. Lower echelons mainly used R/T. Please note that the list below is restricted to the codewords used for communication related to airdefence fighter operations and intercept control. The were additional lists related to: Offensive operations by SG, SKG and KG, offensive operations by NSG under EGON control, coordination between Flak units and HHQ and for telling of the Luftlage. I am indebted to Mr. Christian M. Aguilar, Mr. Klaas van Brakel, Mr. Rod Mackenzie, "Frankie S" and Mr. Mark Stannius for their constructive comments and additional material. Mr G. Aders was kind enough to provide me with a late 1944 copy of the German document. The list now contains the codewords authorized in late 1944, they are all associated with a Morse Tri-graph. Those which are not, are codewords used earlier or introduced later. Procedures and radio phraseology for Seeburg-Lichtenstein Verfahren. When I first published the German phonetic alphabet, it was based on MDv 922, Heft II and it was my belief that this was valid for all 3 services. Mr. Mark Stannius has kindly pointed out, that this was not fully identical to the alphabet found inside the lid of German field telephones. In a follow-up from Mr. Jørn Junker I have been advised that the Lw used the same alphabet. It must thus be assumed that there was at least 2 variants, on used by the Km and one used by the Heer and Lw. Phonetic alphabet found in field telephones.